I am hoping for some thoughts/feedback on these. These are beautiful! Glad you finally shared some, having been there I really enjoy these. Thanks again. Utah, thank you! I have gone the last two years. Year one was a bit of a bust as Congress shut the park down for (what should have been) my first two days and days three and four were a rainy overcast mess. Last year, I drove all night and got in a day a half of good shooting before October rain and haze shut me down. I am having an internal struggle this year between Gettysburg part three or a return to Vermont. If only I could win the lottery and not have to make such choices! "Even" Dean, it's good to see you back on the forum! You've made some nice photos. I especially like the shot with the cannon balls and cannon. The lighting is perfect and the bokeh is nice. A couple of comments about your photos: You've either cut off what I'll call the tails of the cannon or left too little room between the tail and the edge of the image. It is attention to details such as those the separate a good photo from a great one. After all, if the center of interest is the cannon, you should show the whole thing unless you are doing something like what you did with the cannon ball shot or the last one where you intentionally zoom in and the center of interest isn't the cannon per se. I love diagonal lines of the last image; the rock wall and the cannon fading into the background along it. 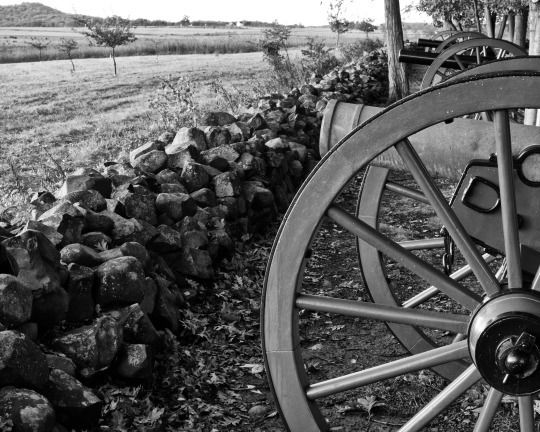 What's more, the black and white rendition is a very good choice because it takes us back to the Civil War when black and white photography was in its infancy. 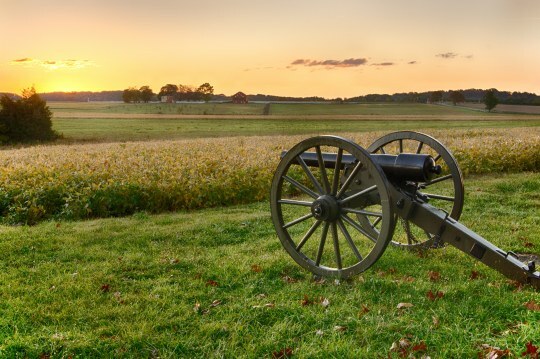 It is sobering to think that there were over 20,000 casualties in the battle at Gettysburg. Thank you and it is good to be back. I know that I have a spacing issues on those images. I have no idea why I did that. I didn't do it anywhere else and I always use a tripod at Gettysburg so, framing wasn't an issue. I have to chalk that up to sleeping for an hour, leaving at 10 PM, driving all night and shooting all morning. Input more than noted and thank you! Gettysburg really lends itself to strong angles. The fences (I won't go full history nerd) were actually a key component to both the South's defeat and to the fundamental differences between the North and the South and the drive for Lee to invade. The South did not anticipate the fences and their implications to movement and deployment so, they have a tactical element. Also, the South were not used to so many fences because a Southern farm needed to be about five times the size (of a Penn farm) due to the poorer soil resulting in smaller yields per acre. The idea that Northern farms could be so successful on such small scales (and without needing slave labor, as a result) was a foreign one. The strength of he land was not a surprise to General Lee and feeding his men through plunder, away from the over stressed and under productive farms of Virginia, was a driving force. (Also a hope for political fallout from a major defeat on Northern soil resulting in a change in administrations come the 64 elections and possible foreign recognition of the Confederacy). In summation, I like to use the fences as the are prevalent, present strong elements and are a key part of the Gettysburg story. 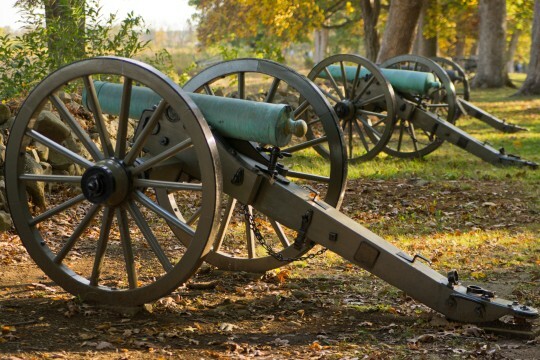 Artillery played a massive role in the battle and is also prevalent across the battlefield. Hard to avoid either and I don't want to. 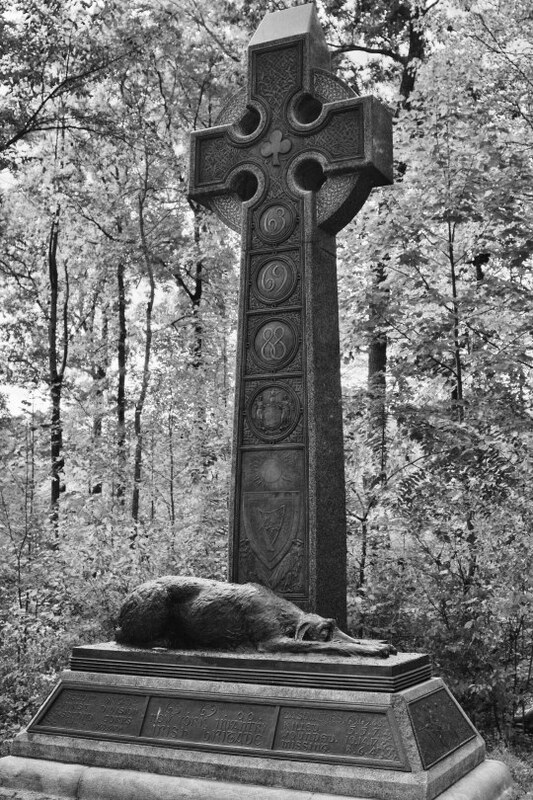 The second picture (from the top) has been selected for the Friends of Gettysburg 2016 calendar. The attachment shows far more of a clipped right side than did my submission. Not sure why that is. Dean, I'm a bit of a Civil War buff myself. (I have an undergraduate degree in history.) I've read a bunch of Civil War books including Shelby Foote's Civil War. I have to admit though that I haven't gotten through the entire trilogy yet. My most recent Civil War read was Grant's memoirs. I found the book to be filled with details and very readable. Your comment about artillery reminds me that if Lee had had accurate artilleryman, he might have won Gettysburg. They overshot the "copse of trees" and the remaining Union force there was able to repel Pickett's charge. That, plus the fact that the Civil War was the first major war fought with "rifled" barreled guns. Had both armies still been using smooth barrel rifles, Pickett wouldn't have lost so many men and Lee might have supported the charge with reinforcements. When I visited the Gettysburg, and other battlefields, for that matter, I tried to imagine the noise and the smoke. It must have been like fighting a battle in a burning building. After visiting the Wilderness battlefield and learning that wounded soldiers were calling to their comrades to shoot them so they wouldn't die from the fire that was racing across the battlefield, I've tried not to imagine the carnage, death and destruction. It had to be so horrible. In this day and age, we can't appreciate how terrible it actually was. The comparison to fighting in a "burning building" is apt. People forget that military weapons today use "smokeless powder". The guns of that era used a far less efficiently burning form of gun powder. Also, the cartridges were (for the most part) made of paper, which also would have created smoke. There are stories about artillery men trying to use their hats and caps to wave the smoke away so that they could see what they were doing. It would have been a terrifying place. One of my favorite quotes about battle is "it is the loneliest place on Earth, that men share together." Col. Porter (Gen. Longstreet's head of artillery and, effectively, the head of Confederate artillery though there was a nominal head whom I will discuss shortly) was excellent. He directed the fire on Cemetery Hill on July 3rd. 1. Fuses - the Confederates had good artillery and lots of it. They got some from Britain (the Whitworth cannon being a rare but interesting example) via blockade running and they got a great deal of it by way of holding the field in the early battles of the war (i.e. capture). What they lacked were high quality fuses. Their fuses tended to not detonate the rounds (a factor in the bombardment) or explode early. Those early explosions would shower the Confederate attackers in friendly shrapnel (friendly shrapnel having the same effect on human flesh as any other kind). On more than a few occasions, angry infantry officers pointed revolvers at their artillery brethren and informed them that the next "short round" would result in additional casualties for the artillery, as well. as a result, Confederate artillery, during assaults, tended to fire a bit high. Rounds failing to detonate ran into the double digit percentages, however, and hampered the bombardment. 1a. Ammunition - the Confederates had a senior general nominally in charge of all artillery. He was generally relegated to staff duty and others (Porter in particular) given field command. On the third day, however, he feared that Union counter-battery fire would put the ammunition reserves at risk so, he ordered them moved farther to the rear. This meant the battle would be fought with only the ammo on hand. 2. Ground - infantry attacking uphill is hard but, artillery hitting the top of a ridge or hill, from lower ground, even more so. Short shots hit the hill and burrow or detonate and long shots carry past the hill and hit in the rear. Add the aforementioned smoke and you are going to struggle to hit anything at the peak. Also, Lee's forces were in a wide arc and Meade's in a more compact inner arc. Picture kids playing duck-duck-goose. Imagine one kid has to run around the group and the other gets to cut across the center. Lee's reinforcements were more spread out and had to run around the circle to get to any place. Meade's men just had to run across the center and were more densely packed. If Lee had shifted reserves, he would have exposed himself to a counter-attack at other points in his line (that he should have faced a counter attack or not is a great debate for the ages). Finally, Lee chose to attack across low open ground. * Artillery - I do not believe the impact of rifling was not as big a part of "Pickett's Charge" as others have thought. The reason being that the Union held its fire until well within the range of smooth bore guns. The Union head of artillery knew that the bombardment was the precursor to infantry and ordered his artillery not to get into an artillery duel and to conserve their rounds for the assault. This caused a hot confrontation between 2nd Corp commander Hancock and every artillery man that he ran into but, it was the right call. Not only did the lack of return fire save the ammunition for repulsing the attack, it also convinced the Confederates that Union artillery must have been crippled by the bombardment (its intended effect). This incorrect assumption resulted in the attack moving on. The devastation that was wrought was mainly from shorter range ammunition like case shot and canister. A few cannons were able to use solid shot to great effect from enfilade (firing down the length of a line or troops, rather than head on). The ground plays a factor here, as well. With the right downward angle, a solid shot round can be "bowled" so that it bounces off of the ground (at about waist to head height) and remains lethal for a hundred yards or more. That cannot effectively be done firing uphill. 3. Troops - Lee chose well known but, battle weary troops across different Corps. They were shot up and tired (even the ones new to the battle marched all night and were thrown right into the fight) and unfamiliar to each other. Lee's best tactician (Longstreet) had his opinion ignored and was assigned to wage an assault he was sure would fail. Meade, on the other hand, had tough Generals at that point in the line and troops available to fill breaches in the lines. Meade's men fought hard and their leader's played a perfect game that day. They exploited weaknesses and defend resolutely. I agree completely on the pain of war. When I arrive at the battlefield, it is still night (some areas are public and can be visited at that time, others are NP land and off limits until sunrise). 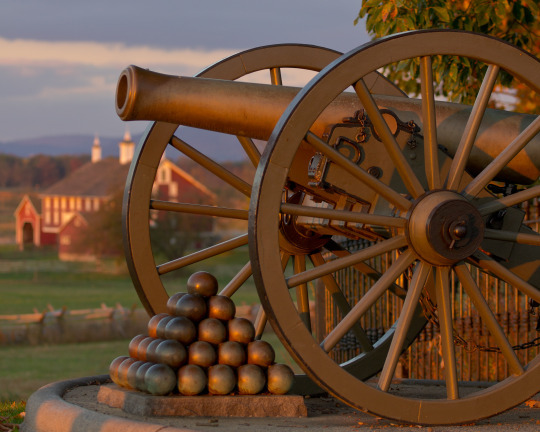 Gettysburg, though much expanded since July 1863, remains a small town so, the night sky is free of light and sound. I feel at peace here. In my mind (and, more often than I care to admit, out loud) I thank the men who fell for their service and ask their forgiveness for finding such beauty in a place of such human devastation. I don't have any fear here. Put me in a creepy old house and I am ready to wet my pants, cry like a baby and run for an exit (and not in any set order) but, here I feel peace. Only when the sun rises and I start to move through each day's actions do I appreciate the human suffering. I think about the men wounded and parched under the hot July sun. I think about the carnage that drove streams red with blood. I think about how the roar of the cannon must have been preferred to the sad sounds of the wounding crying out for water and mercy in "no-man's land" between the lines. There is an area of the battlefield into which I do not venture. In that spot, imperfectly led men died in perfect rows. A mass grave was dug and their bodies dumped in a mass grave until disinterred to journey south. If the corn has not yet been harvested, the foot path to their temporary resting place looks like a dark tunnel through the corn rows. I have never visited that spot and never plan to. Otherwise, the battlefield is a place of solemn finality. It is a place that needs to exist. Humans too easily forget their past and the causes of war. We need to embrace the unity that the blood of that place consecrated as an American bond. I feel welcome there because I believe I see that place and think what they want us to think "Never Again". Sorry for the crazy long post. A bit of a passion of mine - Gettysburg. In case you couldn't guess. Amen Dean, beautifully spoken. I don't know of anyone who has visited this place and not felt the "spirit" that abides there. Deeply solemn yet peaceful. Thanks for this insightful post. P.S. Thanks to you and Al for the history lesson as well!